The U.S. waged an illegal war of aggression on Iraq based on a pretext of lies. 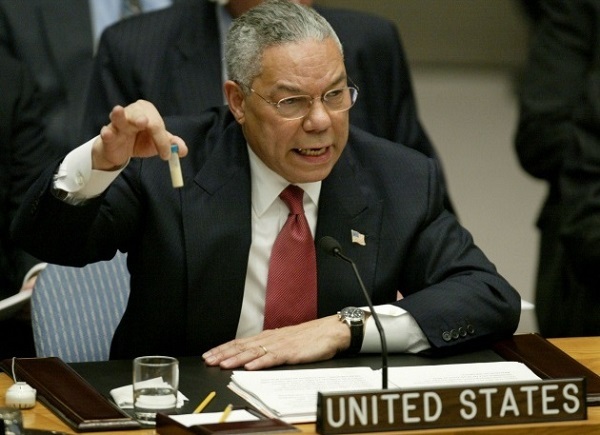 Here, then Secretary of State Colin Powell presents the U.S. case for war to the U.N. Security Council on February 5, 2003. How to accomplish such things is the problem. The disarmament ideas would require governments to dramatically change course, but the governments are often led by the war promoters. Changing the governments in any substantial way would necessitate a dramatic change in the mindset of most citizens. Similarly, although there are theoretical ways to counter the economic interests of war promoters, such as coordinating the purchasing and tax-paying decisions of citizens en masse, organizing for it would require unprecedented changes in public opinion. The arguments of the past won’t make that happen. We can defeat the propaganda of war promoters and counter their economic interests with peace-promoting initiatives like mass purchasing decisions and tax resistance. We can disarm, stop selling arms, and negotiate disarmament agreements. We can do all these things if we are all willing to recognize and overcome the ego-based deceptions behind war. To do so we need to face the problem fundamentally and get out of our comfort zones. The good news is that 9/11 provides a real opportunity to do that and we still have time.